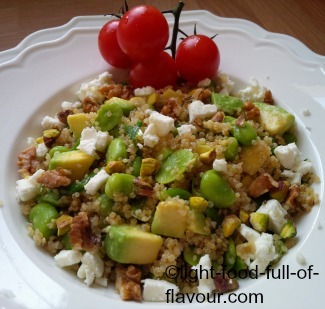 A salad with attitude – quinoa salad with avocado and ginger-garlic-citrus infused fava beans (broad beans). As far as salad goes, this is both a filling and seriously tasty salad. We’ve had unusually warm weather here in England the past week and it has made me hanker after lighter food. But raw vegetables alone will never satisfy my big appetite. 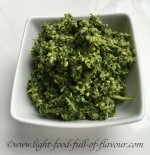 I like adding things like quinoa or buckwheat and fava (broad) beans to my salads - all three are rich in protein and this helps to fill you up. Fava beans require a bit of work as you need to remove the tough outer skin of each bean once they are cooked. It is easy to do though, and I like doing it - I find it therapeutic! This is also a really healthy salad with ingredients that are containing lots of different vitamins, minerals and essential fats. But to make this an even healthier meal, try eating it together with another salad containing dark green leaves – such a spinach, watercress and rocket (arugula) – and tomatoes and red/yellow peppers (bell peppers). 1. Place the quinoa and water in a pot, cover with a lid and bring to a simmer. Cook the quinoa until all the water has been absorbed – about 15 minutes. Remove from the heat and leave to the side. 2. While the quinoa is cooking, get some water boiling in another pot and add the broad beans. Simmer for 4 minutes. Remove from the heat and rinse the beans under cold water. Once cool enough to handle, remove and discard the tough outer skin of each bean. 3. Place the olive oil in a frying pan over a medium-high heat. Add the chopped ginger and garlic to the pan and stir and fry for a couple of minutes. Add the spring onion (scallion) to the pan and fry for a further minute. Remove the pan from the heat and add the fava beans and grated lemon zest. Add this mixture to the pot with quinoa and mix everything together. 4. Place the lemon juice in a bowl. Peel, de-stone and dice the avocados and add to the bowl with lemon juice and toss. Divide the quinoa and fava bean mix between four plates and top each plate with avocado, chopped nuts and some crumbled feta cheese (if using).